Tour Divide is the longest and arguably the most challenging mountain bike time trial on the planet. 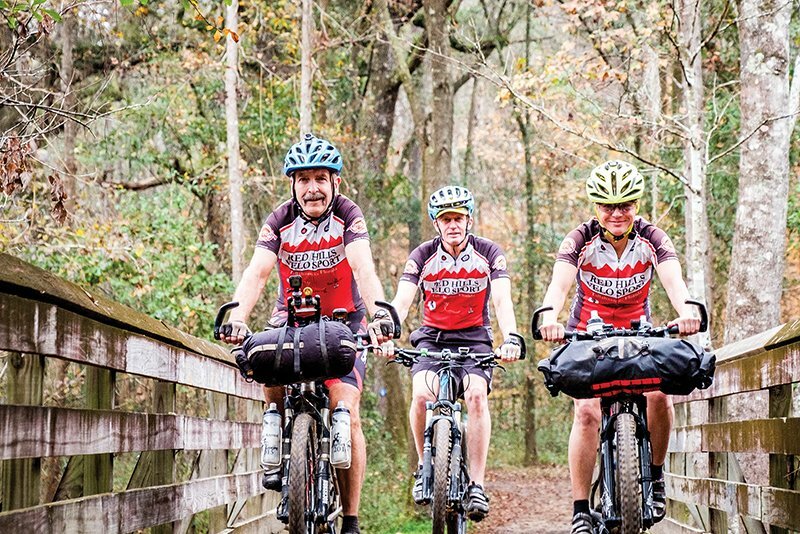 Tallahassean Rick Ashton road his mountain bike for 30 straight days last summer, across 2,745 miles of some of the most difficult terrain and craziest weather in the country, while competing in the Tour Divide. Sometimes carrying his bike from boulder to boulder, he scaled steep, narrow hiking trails. At other times, he peddled up impossibly steep grades or through 40 mph head winds, snow or triple-digit heat. Ashton surprised at least one bear and was almost fatally impaled by a tree limb. Completing this grueling mountain bike race is an incredible accomplishment for anyone, but Ashton did it at the age of 70. Ashton attempted this ultra-cycling challenge three times. He completed it twice. Each time, he was the oldest entrant. On his latest attempt, he finished ahead of his Tallahassee friends, Kim Ortloff, 48, and Kevin Deyo, 60. Ortloff, who was one of only 12 women to finish the route, crossed the finish line 11 riders and three days behind Ashton. Deyo stopped after Day 3. Tour Divide is the longest and arguably the most challenging mountain bike time trial on the planet. Competitors race solo and self-supported over the length of Great Divide Mountain Bike Route from Banff, Alberta, to Antelope Wells, New Mexico. Those who complete it within 30 days “raced.” Those who take more than 30 days are said to have “toured.” The route goes through several national parks including Glacier, Yellowstone and Grand Teton. Nights in the mountainous regions are “chilly.” The days are cool or warm. 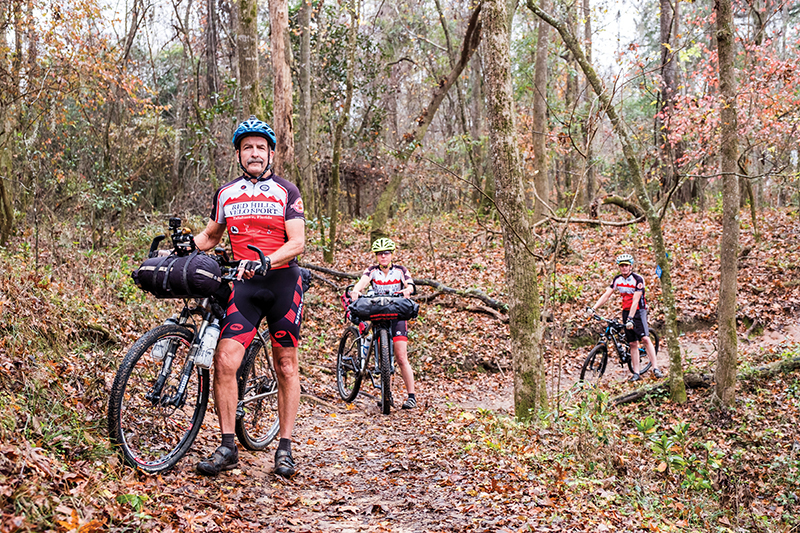 Rick Ashton, 70, enjoys an easy ride through Tallahassee’s Tom Brown Park with fellow Tour Divide riders Kevin Deyo, 60, and Kim Ortloff, 48. Then competitors face the Great Basin in Wyoming. In a vast territory with almost no drinkable water or trees, riders endure a strong northwest wind and triple-digit temperatures. His first attempt at the Tour Divide was in 2009. Out of 47 starters only 17 finished. He dropped out about halfway. He describes the race as 80 percent mental and 20 percent physical. During his second attempt, in 2013, he was more mentally prepared and finished 74th out of 78 finishers and 147 starters. He says the route between Pie Town and Silver City, the last town before the finish, was the most challenging. Ashton climbed 15,000 feet into a section that was a 6-inch-wide hiking trail, with boulders and rocks all through it. He had to push his bike for eight to nine miles. “I was expecting to get to Silver City that day, but it got too dark and too dangerous. I went to sleep in the grass on the side of the mountain. Mentally, that was one of my lower moments,” he recalls. He didn’t get to Silver City until noon the next day. To avoid triple-digit heat, Ashton waited until 3 a.m. to complete the last leg and rode through the desert, mostly in the dark. He finished at 3 p.m.
Ashton said the first time he completed the Tour Divide, he had a very emotional reaction. “When I finished, I was actually bawling. I was so glad I was able to finish. I was sad and happy that it was over,” he says. He knew he was returning to civilization a changed man. This finish, on July 9, was less emotional but just as satisfying. Out of 186 starters, Ashton was 64th out of 80 finishers and the “lanterne rouge” or last place racing finisher. “I’m not doing it again. Of course, I said that the last two times,” he laughs, “but it just takes too much out of your body to do this.” Ashton lost 30 pounds on his second attempt and 26 this time.